The Nun (film, 2018). A 2018 American gothic supernatural horror film with "R" rating by Warner Bros. Pictures. Directed by Corin Hardy. Official Trailer. The Nun is a 2018 American gothic supernatural horror film directed by Corin Hardy. 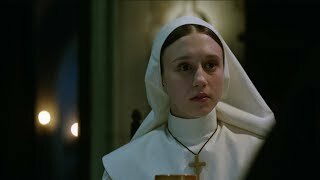 THE NUN - Official Teaser Trailer . Principal photography began on May 3, 2017, at Castel Film Studios in Bucharest, Romania, with Maxime Alexandre serving as cinematographer. The film The Nun was scheduled to be released by Warner Bros. Pictures on September 4, 2018 (TCL Chinese Theatre), on September 6, 2018 (Germany) and on September 7, 2018 (United States). The duration of the film is 96 minutes. With a budget of $22 million, the film grossed over $365.6 million. The Nun got low rating from critics. The audience dislikes the film either. Audiences polled by CinemaScore gave the film an average grade of "C" on a scale ranging from A+ to F.